They help reduce the temperature of our cities and provide habitats for all sorts of wildlife. They even add a layer of insulation for our homes and help to reduce fuel bills. Green roofs are beginning to gain popularity in the UK but they have been part of the urban landscape of European cities like Germany for the past 40 years. Green roofs are installations on top of buildings that provide the environment for plants to grow and thrive. They are increasingly being developed in city centres to help reduce the effect of our carbon footprints, in many cases reducing the Urban Heat Island that we create as we crowd together in high rise flats and office. Find out more about green roofs. In the UK, the idea of green roofing has been slow in its development but in Europe, particularly in countries like Germany, it has been part of their green strategy for some time. Green roofing isn’t a new idea, back in ancient times it was a great source of insulation for homes and communities. From the Hanging Gardens of Babylon to the roof top safaris of Sheffield, the history of green roofs is a story of imagination and innovation. Discover how we fell in love with green roofs. nvironment better to live in. Explore the different types of green roof. Sedum is a brilliantly diverse family of plant that is ideal for use on green roofs. It can work in shallow installations and deeper ones, has the ability to retain water and looks stunning when it blooms in the late summer and autumn. Sedum also provides a deeper level of insulation than other plant types and can be a great help in removing pollution from the air. They are popular for green roofs because of their low maintenance needs. 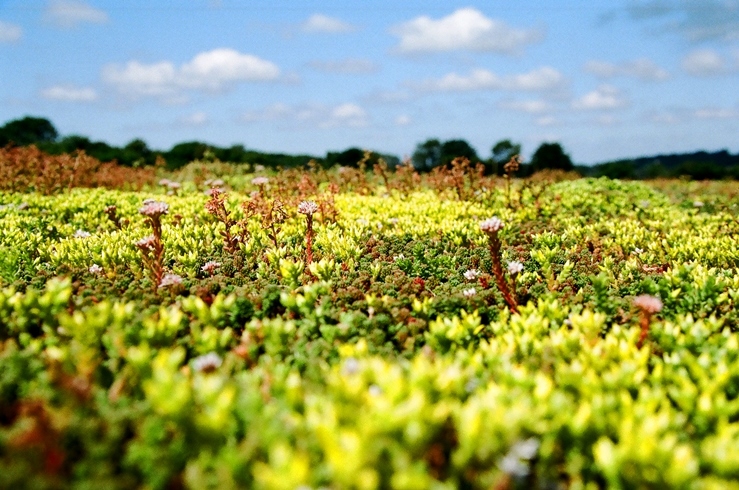 Find out about how sedum can make your green roof irresistible. It’s not just our roofs that can benefit from a bit of greenery. Green walls are beginning to gain in popularity. They work in a similar way to green roofs but are usually installed in self-contained panels that fit together to fill either an inside or outside wall. Discover the amazing world of green walls. Green roofs are one of the simplest of all the sustainable technologies and are easy to fit, particularly if you have a small DIY project you want to undertake. They can be fitted onto garage and shed tops or high up on skyscrapers, but they all use the same basic principles – a waterproof layer and lightweight soil or growing medium – that help promote plant growth and allow your elevated garden to prosper. Discover more about how green roofs work. The creation of more green roofs has particular benefits for our heavily crowded, over concreted, urban areas, particularly large cities like London and Manchester. It can provide a pleasant area for people to sit and walk and it helps to reduce the temperature of the environment. Not only that, it is a valuable source of water control when there are heavy downpours. For domestic properties green roofs provide all that but also offer a better layer of insulation and the chance of reducing fuel bills. Find out about the benefits of green roofs. Whether your property, commercial or domestic, is suitable for a green roof is going to depend on a number of factors, not least the slope of your roof and its load bearing capacity. Other things to consider are how much sunlight you get and what types of plant are going to thrive in your local environment. More than most green initiatives, installing a living roof requires a good deal of planning beforehand. 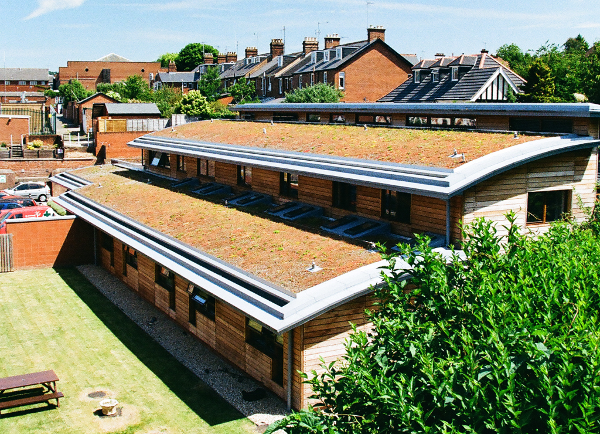 Discover if your property is suitable for a green roof. Costs can vary for a green roof from around £500 for a small, DIY installation to the hundreds of thousands for bigger projects on large office blocks. The bigger the installation then the more it is likely to cost, obviously, as you also need to take into account the design aspect. Added to that there is the issue of ongoing maintenance for green roofs which may need to be done professionally for a large size project. Find out how you cost your green roof project. As with any garden area, there is going to be a requirement for regular maintenance. For a small installation this is a fairly simple process and can be done by the individual. Larger green roofs will need a more intensive and specific maintenance regime which will include ensuring there is no erosion of the growing layer that could have a detrimental effect on the plants. Explore all aspects of green roof maintenance. There are currently no government finance initiatives for green roofs such as the Green Deal or the Feed in Tariff for microgeneration technologies. Many local government organisations are beginning to see the real advantage of creating green roofs in urban areas and financing may well change for those in inner cities who would like to be more eco-friendly. Explore your options for financing your green roof. For most domestic and commercial installations planning permission is not needed to install a green roof but it is worth checking with our local council for any caveats or hurdles that need to be overcome before work begins. New builds often stand a better chance nowadays if they include some kind of green roof in their initial plans. Find out more about planning permission for green roofs. There is currently no formal accreditation for installers of green roofs as there is with renewable technologies and the microgeneration certification scheme. There is however a new green roof code that reputable installers should be buying into. With the growth of popularity in green roofs over the last year or two, it is probably only a matter of time until some form of accreditation comes into force. Explore the green roof code. The 64,000 dollar question is whether green roofs are worth the financial investment. There is ample evidence they help to reduce the cost of fuel bills in offices and houses by providing an extra layer of insulation. But they are also great for making the environment a better place to live in, particularly in cities where they can also help to bring down the surround temperature. If we are hoping to reduce our carbon emissions then green roofs will need to play a prominent role in the future. Is your green roof worth the money you spend? Finding the right installer for your green roof project is all important. It helps to know what you are talking about so we always advise at the Renewable Hub that you do your homework and research as much as possible. You can then search our installer database and find the right green roof installer in your area. Tips on finding the right installer for your green roof.